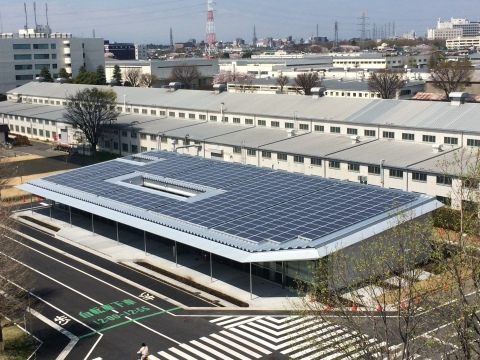 TOKYO--(BUSINESS WIRE)--Toshiba Corporation (TOKYO:6502) today announced the opening of the Toshiba Group Hydrogen Energy Research & Development Center (HRDC) at its Fuchu Complex in western Tokyo. The new Center will concentrate Group-wide initiatives to realize a hydrogen economy, and will drive forward the development and demonstration of solutions integrating hydrogen-related energy technologies. Toshiba Group aims to increase the sales of hydrogen-related business to 100 billion yen by 2020. Toshiba Group has essential technologies, including photovoltaic, wind, hydro and other renewable generation systems, water electrolysis systems and fuel cells, for achieving a hydrogen economy, a future where hydrogen is utilized as a low carbon clean fuel source. Toshiba Group will integrate these technologies in end-to-end solutions, extending from production to utilization of hydrogen. Output from solar and wind power sources is unreliable, but it can be used to power water electrolysis systems that produce hydrogen, and that hydrogen can be transported and stored for use when needed. In addition to other applications, hydrogen is expected to be used as the fuel to for fuel cells, which can produce power and water in the event of a disaster. The combined annual market scale for fuel cells and other hydrogen-related equipment and infrastructure is projected to reach 40 trillion yen by 2030. The HRDC will install a solid oxide electrolysis cell (SOEC) being developed as a New Energy and Industrial Technology Development Organization project and use it in combination with solar photovoltaic generation systems, fuel cells and other apparatus to carry out demonstration experiments, toward achieving practical use. The center will also be an exhibition space for hydrogen-related technologies, in order to better understand customer needs. Toshiba Group will draw on its wide-ranging technologies to promote a hydrogen business that helps to realize a low-carbon hydrogen economy. Toshiba Corporation, a Fortune Global 500 company, channels world-class capabilities in advanced electronic and electrical product and systems into five strategic business domains: Energy & Infrastructure, Community Solutions, Healthcare Systems & Services, Electronic Devices & Components, and Lifestyles Products & Services. Guided by the principles of The Basic Commitment of Toshiba Group, “Committed to People, Committed to the Future”, Toshiba promotes global operations towards securing “Growth Through Creativity and Innovation”, and is contributing to the achievement of a world in which people everywhere live safe, secure and comfortable society. Toshiba Corporation (TOKYO:6502) today announced the opening of the Toshiba Group Hydrogen Energy Research & Development Center (HRDC) at its Fuchu Complex in western Tokyo.